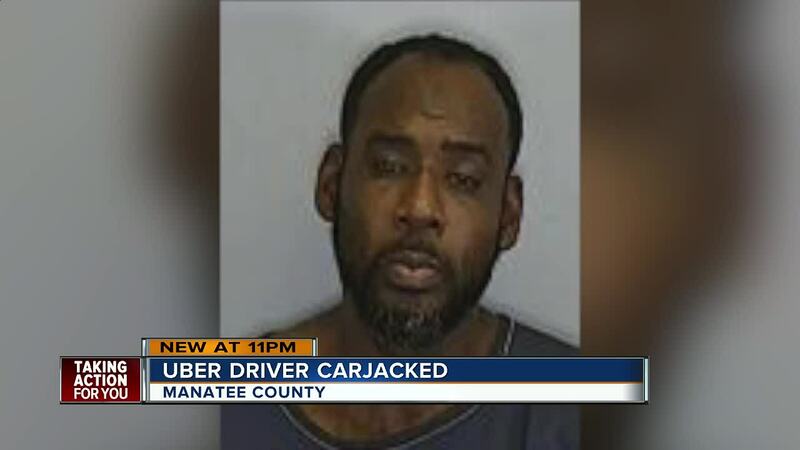 MANATEE COUNTY, Fla. — An Uber driver was carjacked on Monday night by a passenger in Manatee County, deputies say. According to the Manatee County Sheriff's Office, Uber Driver Jose Aguirre picked up Anderson Carter, 48, at an address in west Bradenton around 7:15 p.m. While en route to the destination, deputies say Carter started striking Aguirre on the right side of his face with a closed fist and attempted to get into the driver seat. MCSO says that Aguirre, in fear for his life, causing him to jump out of the moving vehicle. This occurred right in front of a deputy. Carter took off at a high rate of speed and crashed into a vehicle at Whitfield Avenue and 15th Street East. After crashing, Carter fled the scene and continued westbound on Whitfield Avenue. Deputies attempted to catch up to the vehicle. Carter crashed a second time in a retention pond in the 900 block of 70th Drive East and fled on foot. Deputies chased Carter on foot. After utilizing their Electronic Control Device, Carter was taken into custody.